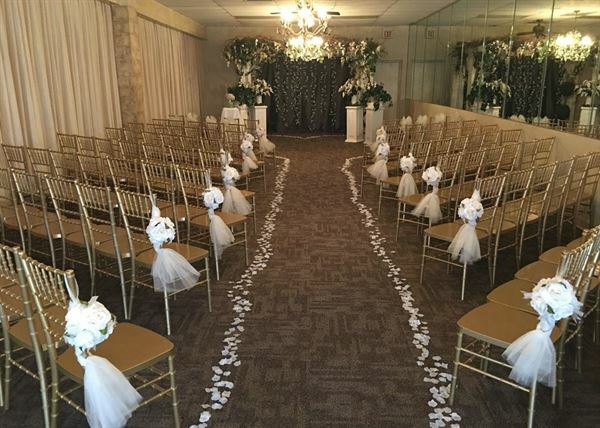 The White Room is perfect for your romantic wedding day. Our large reception hall can accommodate up to 300 guests, with elegantly dressed round tables and formal linens. The large wood dance floor is set in the center of the Tuscan themed decor of the room. Candlelight and elegant chandeliers shed soft light throughout the room. Our chapel, with a grapevine wrapped arbor feels like outdoors with a twinkle lights and candle light sconces illuminating the room, which holds 150 guests. The White Room is the perfect place for your romantic wedding day. Stepping into our chapel, with its beautiful grapevine-wrapped arbor, you feel like you are stepping outdoors. Small, dazzling lights and candlelight sconces illuminate the room, which holds 150 guests. Rates: • Chapel - $400 Please visit our website for more details. The White Room is the perfect place for your romantic wedding day. Invite up to 300 of your closest family and friends to experience the Tuscan ambiance of our exquisite reception hall. Elegant chandeliers and candles shed soft light as you and your guests dine and dance the night away. The exquisite lighting, the large wooden dance floor and the beautifully dressed round tables all help create an unforgettable experience for your special day. Rates: • Friday evening - $695 (60 person minimum) • Saturday afternoon until 4pm - $495 (50 person minimum) • Saturday evening - $895 (100 person minimum) • Sunday - $595 (50 person minimum) Please visit our website for more details. My sister had her wedding reception on 02/14/09 and it was just wonderful. The staff was great and everything met our expectations. I've been to The White Room back in 02/07 for a wedding as well and everything i saw made me refer this place to my family.